Lenoir pianist Madeline Bauer was recently honored by the National Federation of Music Clubs as recipient of the President’s Cup Award for excellence in piano performance. The 90-point trophy is awarded to outstanding musicians who have earned at least as many points in the annual Festival Spring Auditions. Miss Bauer earned a total of 93 points during her 14 years in the Festival, with a perfect record of Superior ratings in the piano solo/piano concerto events. Miss Bauer is the first student in North Carolina to earn this very prestigious award. 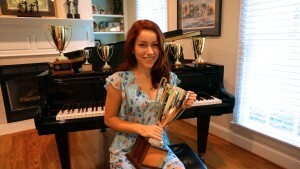 She has been a student of Hickory pianist and teacher Robert Setzer, whose students number a long list of state, regional and national winners in competition events. Madeline, age 19, is the daughter of Dr. Brian and Cynthia Bauer of Lenoir, and is a May graduate of the Caldwell Early College High School. She was a state winner in the North Carolina Federation of Music Clubs scholarship awards auditions in 2006, 2007, 2008 and 2013. Aside from her classical skills, Madeline has also served as keyboardist for the youth and adult praise team of the Flemings Chapel Baptist Church in Lenoir. Madeline has recently finished her freshman year at Furman University.